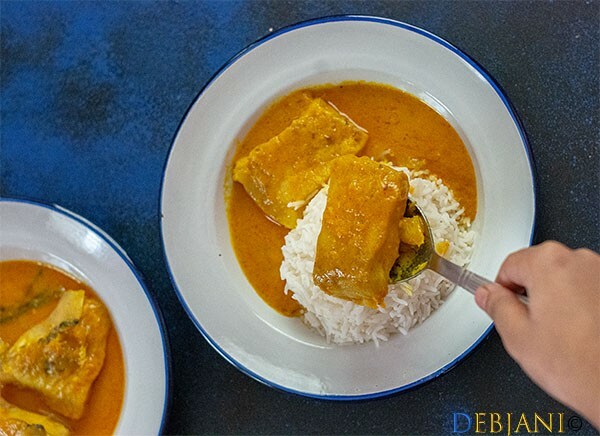 Doi Maach, one of the simplest fish curry recipe that I know. I have started cooking it when I was in hostel using a spirit lamp following Maa’s instructions. This then followed by me cooking it almost regularly when I was working in Bihar and living alone. Last but not least, I was regular cooking it after marriage when we were in Delhi and I used to drive almost 50kms every day! These days I cook it whenever I am out of time; returning from office with hell lot of tiredness or whenever I have to bulk cook. 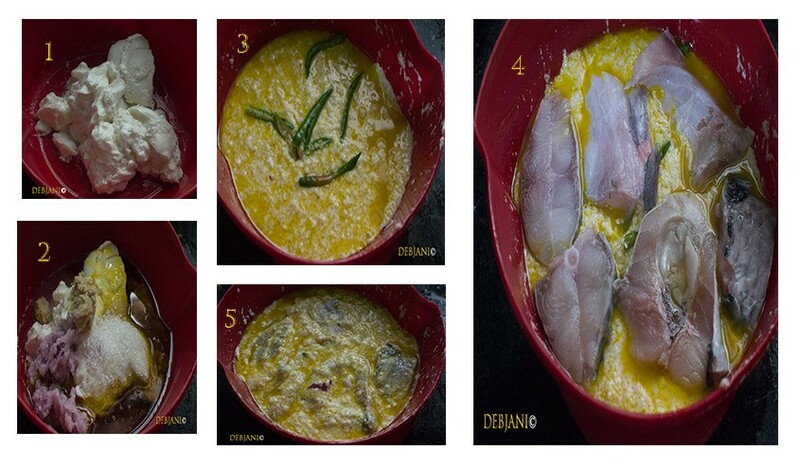 This recipe does not call for frying the fishes and hence ideal for a lethargic person that I am. Mostl importantly both Mehebub and Pasta never comlain when Doi Maach is served! I have had a few versions of Doi Maach. Dida used to prepare Doi Maach after frying the fishes. 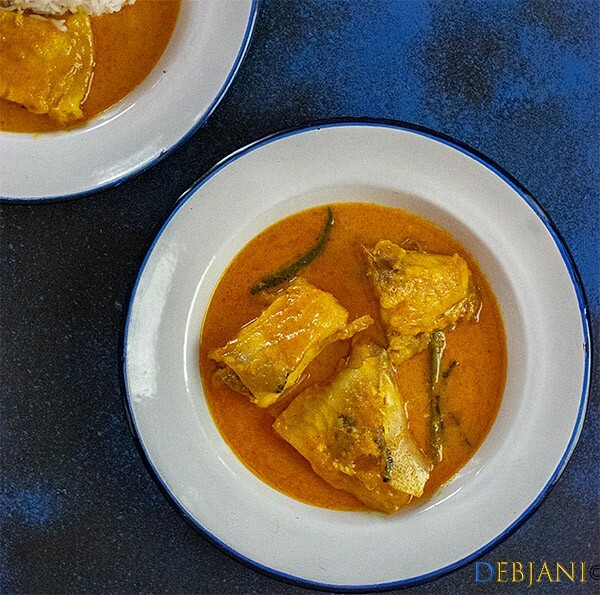 Dida’s Doi Maach was quite similar to Bengali Fish Curry. She used to fry fish pieces and the gravy was prepared with Onion, Ginger, Garlic and obviously Curd. Then there is Chordibhai’s Doi Maach. Chordibhai never fries fish chunks while preparing Doi Maach. Her recipe was actually quite simple. She used to marinate fish chunks with Curd and a mixture of Sugar, Salt, Chili Powder, and Mustard Oil which was then slow cooked. However, I prefer Chordibhai’s recipe over Dida’s recipe whenever I am out of time but in need of good fish curry. Moreover, I found chordibhai’s recipe more authentic in this regard. 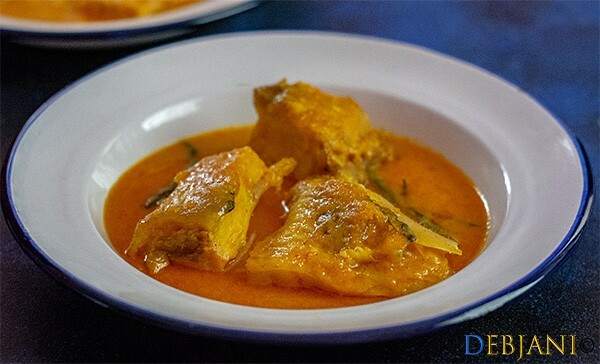 Doi Maach or Doi Rui/ Katla prepared with is a modified version of Doi Ilish prepared with Hilsa fish. 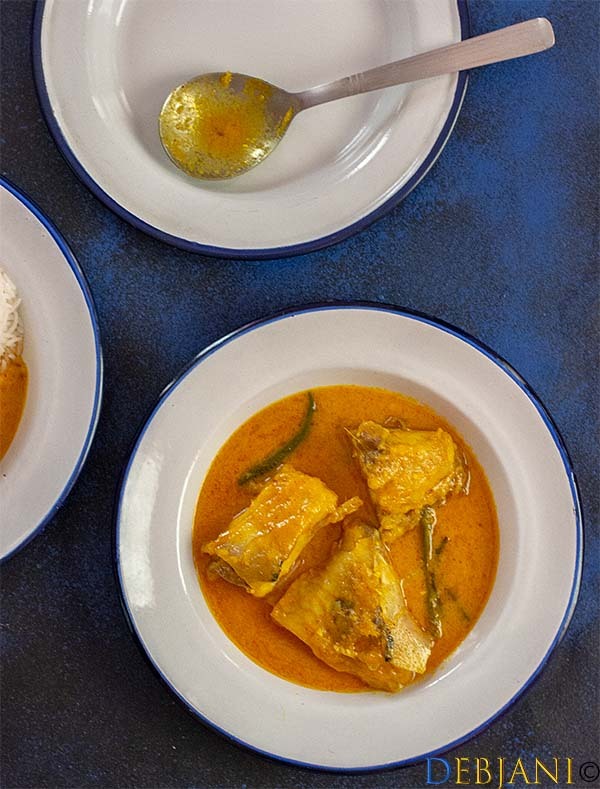 While cooking Doi Ilish we don’t fry fish instead we steam it and for me, the same applies to Doi Maach a.k.a Doi Rui or Doi Katla or Doi Pona. I have modified Chordibhai’s Recipe a bit according to my taste. I prefer to add little Onion paste along with Ginger-Garlic paste in my Doi Maach to give it a bit different taste. So Onion, ginger, and garlic are optional but this is how I prepare Doi Maach at Debjanir Rannaghar. Last but not least; Doi Maach is ideal for bachelor cooking, have I mentioned that 🙂 ! Since you need some basic ingredients and then a few minutes of boiling and voila! I mostly make Doi Maach in Microwave for hassle-free cooking and if you are not available with a Microwave then just boil it in a pan and you are done! Here’s how I cook Doi Maach at Debjanir Rannaghar! Kashmiri Chilli Powder: ½ Tsp. Wash Fish chunks thoroughly and rub little Salt and Turmeric Powder to the Fish Pieces. Take Plan curd in a big Bowl (I prefer to use Glass Bowl with a lid) and beat the Curd using a spoon. Now add Onion Paste, Ginger Paste, Garlic Paste, Bengali Garam Masala Powder, Kashmiri Chilli Powder, Turmeric Powder, Sugar, Salt and Mustard Oil to the Yogurt and give it a proper mix. Add at least two cups of water to dilute the mixture. Now place Fish pieces over the Curd mix and coat all the fishes properly and then leave it for around 45 minutes to 1 Hour. Transfer the Fish with the entire marinade in a microwave-safe bowl with a lid. After that open the Lid and add slitted Green Chillies and again cook in 100% or in high for 10 minutes. This will give Doi Maach a fresh aroma of Green Chillies without tempering the green color of Chilies. If you are not available with a Microwave Oven then just take fish with the Curd Mixture in a Deep vessel and cook for 15 minutes in low flame and then for 5 minutes after adding Green Chilies in high flame. Give the dish a rest of 10 minutes before serving! Instead of plain curd, you can use Yogurt with no added flavor. You can skip Onion, garlic, and ginger. You may skip Turmeric powder if you want your curry a bit whitish. Have you tried the Doi Maach Recipe from Debjanir Rannaghar!